In this post, we will introduce to you our collection of Magento 2 themes. Being a Magento Technology Partner, we are confident that you are going to love the quality of the collection. Inside this collection, you would find our hand-crafted themes, made with extra attention and quality-checked with great scrutiny and care. Our themes strictly follow Magento 2 Extension Quality Program, meaning better coding structure, performance, scalability, and compatibility with Magento core. All of our themes (both premium and free ones) are made to be responsive on screen width ranging from 320 px to 4k px, and freely configurable. That's for now. We hope that you enjoy this collection. 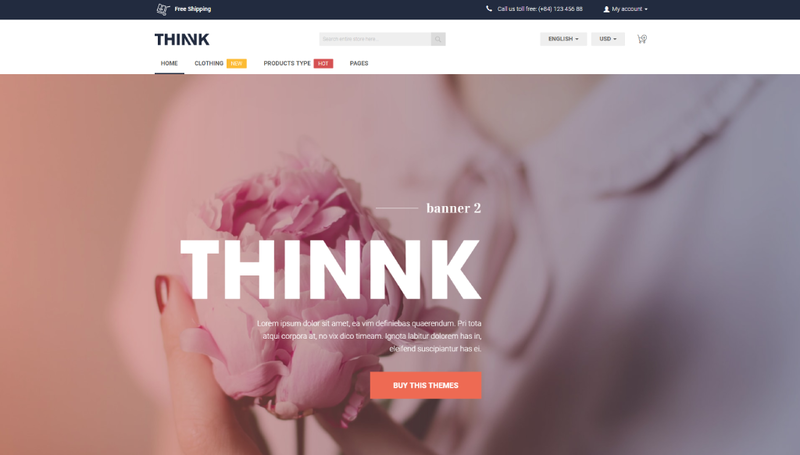 THINNK is the one theme that started it all. It is inherited from BSS Default, which is the child theme of Magento default theme Blank. Our BSS default is made solely for the function, not the design, so we do not present to you. Although previously, for 4 years we had been making various custom themes for customers of BSS Geek (from bikini to motor sellers), THINNK was the first theme that we package and present to the public. The theme was designed based on our previous experience working with customers from all industries with different company size. Moreover, it was made of our love, passion, and vision of giving online store owners the best web design. The main color used is orange and navy, creating a sense of modernity and feminity. The design also makes use of both Serif and Sans-serif font. There are many spaces between sections of the theme, making the eyes rest and the message more readable. Topaz is the child theme of THINNK. It inherited all the good things from THINNK, and it contains the theme THINNK inside it. Topaz was our second theme that makes it to the public. From this theme, all our themes would be named after a type of crystal. This theme can be used for various industry, although it has many sections that support fashion stores. In our latest update, Topaz has been standardized to follow Magento's Extension Quality Program. The theme's quality has been checked and approved by Template Monsters. Citrine is another story. It is a wide horse that inherits from BSS default. 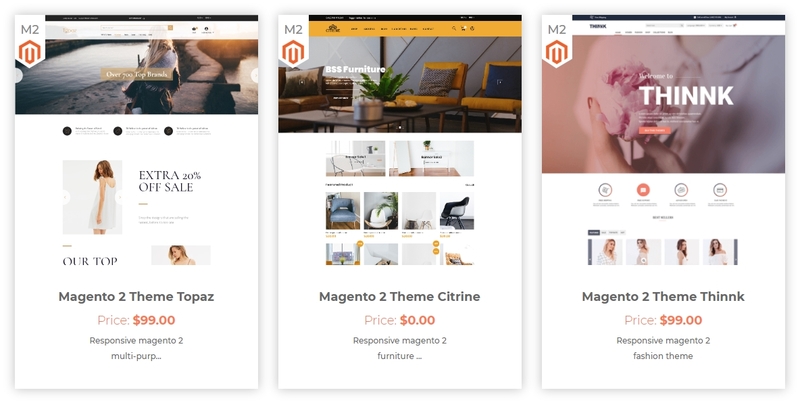 In making Citrine, we think that everyone on the internet, including Magento 2 beginners and basic users, should be able to access Magento 2 high-quality themes without having to pay. Although it lacks strong functions, the theme is developed in a lean manner and can function basically with low page speed. On top of all, you can download it for free. We are always moving forward in terms of updating the themes to add more powerful features. Please that note that according to our Terms and Conditions, all our premium themes are provided with lifetime free update. Aside from that is 1 year of free support, installation, and 30-day-money-back. That's why we see no reason for you not to see our collection of themes below. Make sure to check out!